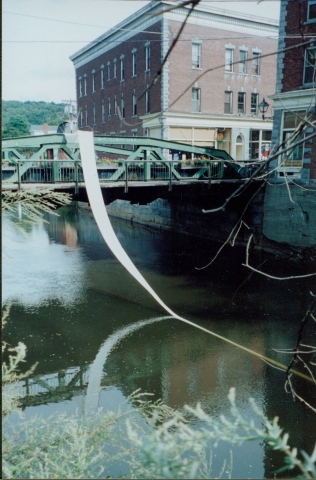 Made for a river festival, this length of while gauze stretched from the bridge to the water before continuing underwater for yards and yards, hardly rippling. The reflection was exactly as hoped. "White Reflection" lasted one day and one evening. Vandalization occurred immediately after the closing of a nearby pub. Merrymakers ripped the gauze from its bridge attachment, hurling it into the water. Catching on a snag, it writhed underwater for several days before I dragged it ashore.